Every Wednesday from 6:00 PM to 9:00 PM, the members of Old Palm pour into the Club lounge for Pub Night. Itâs a fun-loving, casual get-together where friends can catch up over drinks and just be themselves. Itâs the one night of the week where denim is permitted in the Club and as always informality rules. The TVs are on, the conversations are lively, and the hors dâoeuvres run the gamut from seared tuna to freshly grilled sliders. Just outside, a golf tee mat is usually set up so members can fire shots at the 19th hole green, trying to win the closest-to-the-pin contest. But the good times arenât just limited to adults. Once a month, we also hold a Kids Pub Night on the lawn next to the lounge. The activities change all the time. 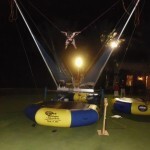 Recently, the kids were outside bungee jumping while their parents were inside enjoying the camaraderie. Thanks to Pub Night, Wednesday may be the most exciting day of the week. Bar none.